Xiaomi recently launched its Mi Note 2 with a curved dual edge display in China. The 3D curved glass back sandwiches series 7 aluminum frame within it. The front uses a flexible OLED display measuring 5.7 inch and supports Full HD (1920 x 1080 pixels) resolution. This beautiful, curved display provides the phone with 77.2 % screen to body ratio. As the event was tagged 'curved to impress', the phone seems to carry everything that the deceased Note 7 took away with itself. The starting price tag of 2799 Yuan (INR 27,600) makes it a bit more expensive over all other Xiaomi phones launched till date. The phone comes with 2.35 GHz, Quad Core Snapdragon 821 Performance Edition SoC, paired to 4 GB of RAM and 64 GB of internal storage on the base variant and 6 GB of RAM and 128 GB storage. Another edition with 37 LTE band support, tagged as global edition has also been made available with the higher model's configuration. Xiaomi Mi Note 2 uses a massive 4070 mAh battery with Quick Charge 3.0 support. The beautiful phone is being offered in Piano Black and Glacial Silver, offering aluminum frames on both the variants and shades. The phone support Mi Pay, offering hassle free payment solution to the owners. The rear camera on Mi Note 2 is a 22.56 MP unit with Sony IMX318 Exmor RS sensor. It offers f/2.0 aperture, PDAF and Electronic Image Stabilization, which further takes help from the gyroscope of the phone to reduce shaking and presenting a stable 4K video. The front camera uses an 8 MP camera with Sony IMX268 sensor and Auto Beautify 3.0. Mi Note 2 also uses Acoustic Audio Processor with 192 kHz/24 bit sound quality. While there has been no news about the phone's launch in India, it will retail in China for 2799 Yuan (INR 27,600) for the 4 GB/64 GB version, 3299 Yuan (INR 32,600) for the 6 GB/128 GB version and 3499 Yuan (INR 34,600) for the global version. The phone runs on Xiaomi's custom MIUI 8 interface and claims many new functions within its operating environment. 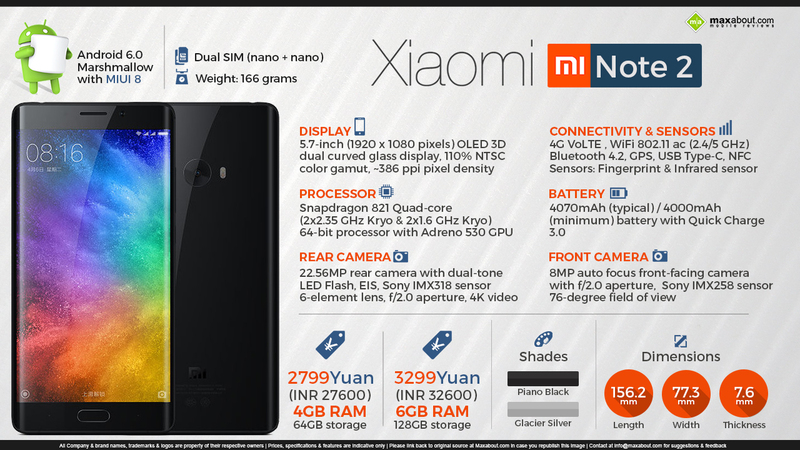 Click here to know more about Xiaomi Mi Note 2.